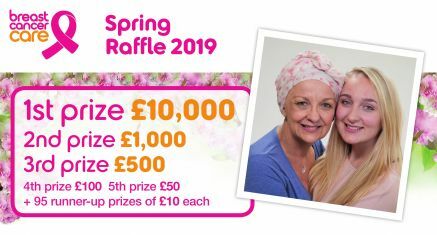 Breast Cancer Care conducts the online element of their raffles through CFP Lottery & Raffles Ltd - a registered External Lottery Manager (ELM) licensed by the Gambling Commission. CFP Lottery & Raffles Ltd operate a platform which complies with all relevant codes and remote technical standards. The ELM (CFP Lottery & Raffles Ltd) operates the payment function and are responsible for the payment of income back to the charity. Ticket and chance distribution records are available for police checks. Breast Cancer Care will only use gambling software (a Random Number Generator (RNG)) produced by CFP Lottery and Raffles Ltd which has been approved by the Gambling Commission. Banking reports are issued by the ELM (CFP Lottery & Raffles Ltd) to an agreed schedule. They will provide contact and payment details of any monies received. All funds from your online ticket purchase are credited directly into the charity’s account. Draws are conducted using a random number generator, or blind draw, on ELM premises (CFP Lottery & Raffles Ltd) in plain sight of staff and ourselves. We publish draw results on our website and in letters to players. Rules are also available on our website. Rules and results are always available on request. A record is kept of both online and ticketed sales, as well as tickets not purchased but distributed regardless of whether they are returned or not. Breast Cancer Care will reserve the right to offer alternative prizes of equal value if, due to circumstances beyond its reasonable control, the stated prizes are no longer available. There is an additional Charity Complaints Procedure. Our ELM's advisers (CFP) handle initial complaints and queries and will complete a log sheet detailing the caller’s and advisor’s contact details, the nature of the complaint and steps taken to resolve the complaint. If an initial complaint cannot be resolved, we are notified immediately of the issue and will resolve it internally. In the event that a telephone or online complaint cannot be resolved by the ELM (CFP) or representatives of Breast Cancer Care, CFP will provide free third party arbitration via IBAS. All general queries will be logged and held for future reference. Our ELM (CFP) will retain these telephone log sheets for three years. Our ELM’s administration team (CFP) will respond to complaints and queries within 48 hours of receiving the complaint. The subsequent logging and resolution procedure is that of telephone complaints. Complaints log sheets and written complaints are retained by our ELM (CFP) for three years. In the event that a written complaint cannot be resolved by the ELM (CFP) or representatives of Breast Cancer Care, CFP will provide free third party arbitration via IBAS. All general queries will be logged on the log sheets by the ELM (CFP) and held for future reference. On all cold data used, it is requested that all persons under 18 years of age are excluded from the list before being supplied for the use of our lotteries. Where possible we check our database to ensure persons are above the legal age limit before data is supplied for the use of a lottery. Chances may only be purchased once the player has self-certified that they are over 18 years of age. Any player who provides dishonest information regarding their age automatically forfeits the right to any prize. Any player that is found to be under 18 years of age will have any monies paid in relation to the lottery returned to them. If in doubt, Age Verification software will be used to ascertain the age of the entrant. Any portals for remote customers will carry a warning before chances are purchased stating that underage gambling is an offence. Customers will then be required to confirm they are of legal age. The age verification system will be reviewed regularly and we will implement all reasonable improvements that may be made as technology advances and information improves. Website will permit filtering software to restrict the access to relevant pages. Our website carries information encouraging people to gamble responsibly, and recognise the signs of problem gambling. We also include the National Gambling Helpline and www.begambleaware.org website details for people to refer to should they need further help. The National Gambling Helpline number and GambleAware website address is included on all tickets and entry forms to lotteries as well as our website address that includes information on gambling. Players can request a self-exclusion to be added to the Breast Cancer Care database so that they are removed from further addressed lottery communications including post, telephone, email and SMS. All self-exclusion requests along with the date of the request will be captured on to the record on the Breast Cancer Care database and will be in place for a minimum of six months. All reasonable steps will be taken to prevent any self excluded individuals participating. Staff are trained on self exclusion and will signpost counselling and support services. To stop receiving unaddressed mail delivered by your postman, visit the Royal Mail website (link is an external). A restriction of 60 tickets per customer will be in place unless customer interaction occurs. Without customer interaction chances will not be entered in to the draw. Interactions will be recorded and where the tickets are purchased beyond the limit, records will be kept for 3 years. All relevant sources of information will be used to identify customers at risk of problem gambling. Lotteries are only conducted with an External Lottery Manager (CFP) who is registered with the Gambling Commission (licence number 000-000-584-R-103711-007). Players must be over the age of 18 to purchase chances. Players will not be able to proceed to the payment page until they have self-certified that they are over 18 years old. If there is any doubt as to the age of a self-certified player we will use Age Verification software to seek confirmation. For any records which are not matched, we use a secondary stage service where records are run against the electoral role. If this proves unsuccessful, where possible we will try to contact the player by telephone. Once payments have been successfully processed, a confirmation email is sent to entrants confirming their playing status. This email includes a self-certification statement confirming the entrant is over 18 years of age. If we are unable to verify the age of a player the payment will be returned to the entrant. The minimum age for play is 18 and is detailed on the back of all tickets and entry forms produced. Any player who provides dishonest information regarding their age automatically forfeits the right to any prize. This fact is also stated on the reverse of all tickets and on all entry forms. Any player who is found to be under 18 years of age will have any monies paid in relation to the lottery returned to them.